Spring is here, now is the time to check for the damaging effects of winter. This spring checklist will make sure your vehicle is ready for day trips and warm weather. Here’s a few reasons why you should get your vehicle checked – to avoid spoiling any outdoor fun. When the hot weather hits, you don’t want to find out then that your air conditioner isn’t working. Getting your a/c system checked now can avoid any problems in the future. A complimentary alignment check is just one of the perks to getting your car serviced at the Auto Clinic. Winter can have damaging effects on your alignment, and if not checked before you decide to put miles on your vehicle for summer, you could be at risk to have premature tire wear. 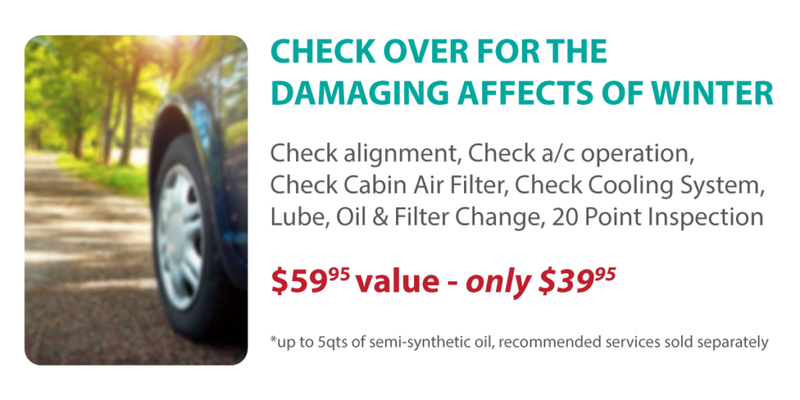 As part of this spring special, we will be able to tell if your vehicle needs an alignment, before paying for one! Your engine coolant is one of the key components to keeping your engine from overheating. Ideal operating temperature for your vehicle is normally 195 degrees, anything below or above can be a strain on your engine. Over time, your engine coolant breaks down and loses it’s ability to properly cool your engine. Furthermore, it’s important to make sure all components of your cooling system is working properly, which includes engine coolant, radiator, water pump, cooling hoses, and electric fan. To avoid any chance of your vehicle overheating on a hot day, make an appointment with us today. Mother nature during the winter can put a strain on your cabin air filtering system. Between critters using your vents as a place to hibernate, or the moisture causing mold in your filter, springtime is a great time to check your cabin air filter and venting system. One of the most inexpensive yet important maintenance services you can do – is change your oil! Modern vehicles are claiming they have better gas mileage, but it is coming at a cost of oil consumption. It’s imperative to check your oil levels at least every 6 months, and get a lube, oil and filter change at least once a year. Before your next long road trip, getting a lube oil and filter change will keep your car running as long as possible. Take advantage of our Spring Special now and get your vehicle all set for the fun in store! Book online today.